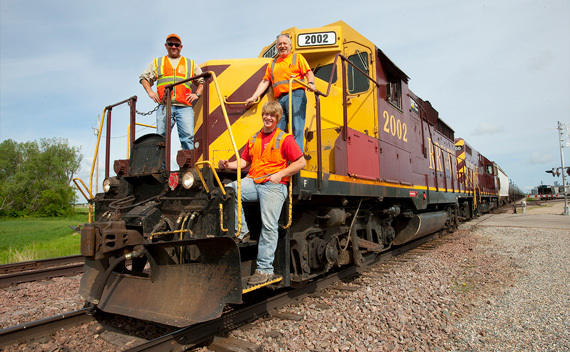 Our benefits program reflects just how important we believe our employees are to the success of the Red River Valley & Western Railroad. RRVW takes great pride in its employees and is committed to providing a comprehensive benefits package to them. In order to drive company vehicles, which most employees are required to do from time to time, you need to be insurable with RRVW’s insurance company. All positions are subject to pre-employment drug testing and most positions are also subject to random drug and alcohol testing. In order to operate a locomotive or work as a conductor, you are put in a random drug and alcohol testing pool along with the rest of the employees who work in the Transportation department. We also have random testing pools for CDL drivers and for drivers of vehicles between 10,000 and 26,000 pounds. All people hired for train service must be qualified engineers. The federal government has guidelines for hearing and vision qualifications. Engineers must be able to distinguish colors (red and green) and must have an acceptable hearing level. Please be aware that if you do not meet these qualifications, you may not be eligible to become a certified engineer. Reference checks and citizenship verification are performed before a candidate can be hired. Pre-employment physicals are required before hiring. This includes back x-rays.